A majority of the time when you attend a kids movie you have a general idea what to expect, lots of literal jokes involving bodily functions, weird faces, and an overabundance of physical comedy. 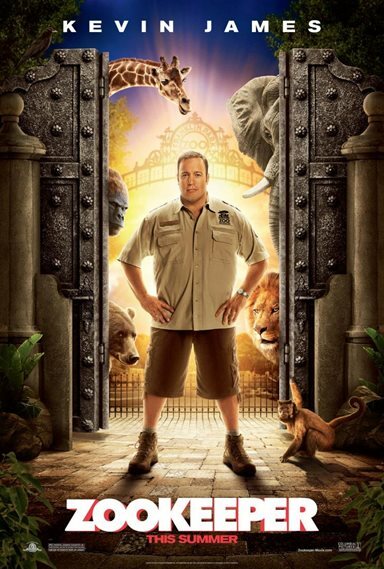 Zookeeper, the new film starring Kevin James and Rosario Dawson is no exception. James' character Griffin Keyes is your typical glass-half-full type of guy, always looking at the best in everything and gullibly believing that everyone around him is as sincere as he is. When the film begins its opening sequences we watch as Griffin is about to take those first steps into a new life by proposing to his girlfriend Stephanie (Leslie Bibb). Even before she opens her mouth to say "no" we are well aware of the answer, her character's personality is written all over her appearance and with a movie like this her motives are quite transparent. After such a huge rejection Griffin retreats into his life as a zookeeper focusing all his attention on being the best zookeeper he can be. All of the animals in the zoo adore him and he is well liked by all of his co-workers. But even with the happiness and security that his job provides, Griffin still hasn't fully recovered from his rejection so long ago. Random chance re-unites Griffin with his past love when they bump into one another at the zoo. Even after all this time he still holds a torch for her and he believes his only chance at true happiness is having her in his life. Lo and behold one night as he is pining away for a chance to rekindle the flame between he and Stephanie the animals of the zoo approach him all at once revealing that they are capable of human speech and wish to help their favorite zookeeper reclaim the love of his life. This of course leads to some interesting hijinks as the animals teach him, in their own way, how to attract Stephanie's attention. What Griffin doesn't realize is that he already has someone in his life who is a true match for him and that is Kate (Rosario Dawson), a fellow employee who has a crush on Griffin but like him lacks the courage to do something about it. Of course while the movie certainly makes interesting use of the animals in the movie, placing them in some funny situations like the scene at T.G.I.F's (who knew a T.G.I.F's could be so fun?) but that's the only real enjoyable part of the film. For the rest of the time the plot follows the typical formula where man meets woman, man and woman fall in love and live happily ever after. Even with the humorous efforts made by the animal characters in the film it's the human characters that are at the center of the movie and unfortunately they fail to add anything new to a poorly written script. Until the next batch of summer blockbusters arrives in theaters, movies like Zookeeper are all that we have to look forward to this weekend. Thankfully given that the film is geared towards the younger audiences it gives parents a way to beat the heat, entertain the kids and passes the time until something more worthy comes along. Download Zookeeper from the iTunes Store in Digial HD. For more information about Zookeeper visit the FlickDirect Movie Database.